Surface Protection Services LLC, or SPS, is a full-service pavement maintenance contractor. We offer a wide range of services throughout Kansas and Northern Oklahoma, with an emphasis on the Wichita and surrounding area. Our services include sealcoating, crack sealing, asphalt paving, pothole repair, large crack repair, striping, and concrete construction and repair. We offer free pavement assessments and estimates for all of our services. You, along with your customers, will be treated with the respect that you deserve. 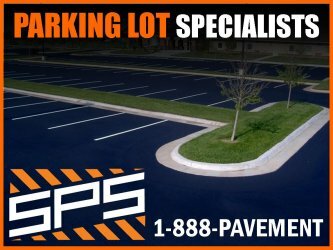 We will do whatever it takes to ensure a great experience while hiring us to repair, seal, overlay, or stripe your parking lot.